My daughter sent this and said I and my spelling would fit in the tea party well. I may need a dictionary. I felt his priorities, particularly cooking and beer making which are pretty much the same general thing, were sound right up to that last one. My beautiful wife and son, Type 1 diabetes, Math, Teaching, Low carb recipes, Diabetes blogs, Evolutionary fitness, Eating, Humanely raised foods, Locally raised food, the Lakers, Gardening, Hiking, Supporting our local economy, Beer-making, Cooking, Co-housing, Community. I obsess about my blood sugar and spelling words correctly. Regulating T1 BG with Leptin. This twisted my (limited) understanding of insulin and BG around. Hi there FDA. Me again. I don’t mean to get on your nerves and I am sorry if I am. Well not too sorry, maybe a little. Anyway I was skimming through some websites tonight and I read a bit that seemed to relate to the whole meter accuracy thing. I used some of it here, admittedly a little out of context, but hey it still seems to make the point that treating diabetes is critical. There are real risks, so improvement to robust and reliable traditional blood glucose meters has enormous potential benefit. …critical initiative of the Food and Drug Administration (FDA) is to accelerate the development and availability of a safe and effective … treatment of diabetes mellitus. Compounding… difficulty is the trade-off between improved glycemic control and an increased risk for hypoglycemia (low blood glucose levels), which can cause seizure, coma and death. So FDA, in case you still can’t place those bits here's a reminder. Y’all said’m. You were talking about the artificial pancreas. Oh by the way we are artificial pancreases now. Here's a way to say Love Ya / Mean It to Kerri, Chris and Miss BSparl! Just before the birth of our first child friends and family passed around a small blank notebook. In it they recorded parenting advice, mostly of the possibly practical but certainly silly nature. It was fun. I particularly liked the stuff about a parent’s responsibility to embarrass their teenager. With the highly anticipated début of Miss BSparl, I suggest that her mom’s online friends offer our brilliance on the topic of child rearing. Having been raised ourselves; I submit we all have more than sufficient expertise. Some of us may even have experience raising kids who successfully moved out of our houses. With our wisdom in hand, Kerri and Chris need only do the polar opposite of our suggestions to be assured total parenting success! Your caring comments are welcome. We have even created categories to post under. Want to suggest a new category? There is even one for that at the bottom. Humor and joy are welcome. Celebrating babies is what communities do jump on in. Thank you for providing the opportunity to comment on blood glucose meter accuracy. I am the father of two insulin dependant children ages 12 and 16. The younger has been on insulin for 6 years and the older 7 years. I write today from the perspective of a parent and type 1 parent’s advocate. Many of those users are families of with children with type 1, insulin dependant, diabetes. Because of this insulin dependence these families are injecting insulin either with an insulin pump or with shots also know as Multiple Daily Injection. To minimize the risk of hypoglycemia these multiple daily doses of insulin must take into consideration the child’s blood sugar at the time of injection. We can only estimate or children’s blood sugar to be with in a range of plus or minus twenty percent with current meters standards. I hope that the FDA will consider the difference between those diabetics who have this multiple daily need for actionable accuracy in the dosing insulin in addition the needs of those diabetics who do not use insulin. What is important in this process is the glycemic control mentioned in the FDA quote above. While meters have improved over the past three decades, current standards have had the effect of halting innovation since the standards were created. The current standard of +/- 20% was defined by ISO 15197, established in 2003. I am unaware of standards for quality assurance. I do know that variance from strip batch to batch has been reported to be an issue. Also counterfeit strips have been a cause for concern as has interference from medications. Every day millions of American households are treating type 1 diabetes in children with devices that were not intended or evaluated by the FDA for that use. It isn’t that we want to use meters in ways they were not evaluated or intended to be used. It is that the FDA has not evaluated meters for this use. We have type 1 now. It needs to be managed now. Type 1 diabetes is a 24/7 condition that is primarily managed by the individuals and families it effects. As noted above better glycimic control is achieved with multiple daily doses of insulin. While this is done in consultation with and coaching by a care team of physicians, diabetes educators, nurses and dieticians the day to day primary care management responsibility falls on the individual and family with type 1. We would love the support of the FDA in this daily effort. Specifically by evaluation the tools we use for the use we put them to. Further the FDA should recognize that the technological progress of the past three decades didn’t stop in the early part of that past decade. We need accuracy standards that envision our daily lives, meet the actual use of our meters and progress with technology. I hope the FDA will establish standards quality control, clear communication of accuracy standards, interference from other drugs and safeguarding the supply system from fraud. Clear communication of accuracy standards met in meter marketing would allow consumers and their care team to select the tool based on capability. This would facilitate physicians’ ability to prescribe tools based to the degree of control and intensity of the management program they are recommending for their patients. Tighter accuracy standards of +/- 10% would be a positive action step on that path. Click here for the FDA and post your two bits. I want significantly improved accuracy for all meters for all persons with diabetes. It is not only the 20% inaccuracy that is permitted which I find UNacceptable, but perhaps even more so that it only has to be within that 20% above 75 mg/dl 95% of the time - NINETY-FIVE PERCENT OF THE TIME. The other 5% are considered "outliers" without explanation. To hear some in industry or academia discuss it, it felt to me as if outliers are considered nothing more than dots outside of the Clarke Error Grid A/B Zone. But I view the very same dots as flashing warning signs with alarms going off - CAUTION - because of the potential human consequences that may result from that # on the meter. Some of us are very in tune with our bodies or our children's bodies and know enough not to dose based on a reading that seems so far beyond what we think may really be going on in the body. NOT every person with diabetes, and not every caregiver of a loved one with diabetes, has that intuition, or perhaps has ever had the education to know not to dose without checking again. Many of us are fortunate to have extra test strips to use when we question a number on a meter that doesn't seem congruent with the situation. Some people barely can afford a single test strip let alone 2-3 extra to figure out what the approximate bg value is. So what happens to the 2 yr old whose parents are underinsured, less well educated, or given the cheapest and least accurate meter on the market and the meter says, for example, 350 mg/dl prior to a meal and they give a whopping dose of insulin to correct for the 350 that had they rechecked would have discovered bg was closer to 120 mg/dl? Every single outlier is a potential disaster. It only took the memory of one seizure requiring glucagon injection in my toddler in 1989 or 1990 and the thought of how many have occurred and how many in the future may occur due to meter inaccuracy and excused outliers - to know I needed to stand up before FDA/CDRH and plead for the need for increased accuracy and the ability to compare meters based on performance accuracy. We need to eliminate every possible variable that we can in our daily journey of the diabetes roller coaster ride and tightrope walk. AND we are calibrating our CGMs based on these meters that require less than adequate precision and accuracy - what if your calibration is based on an outlier? Mrs. YDMV and I have been splitting shifts between the home front and the hospital where they managed to pull Connor’s appendix out of a hole they cut in his bellybutton. Nice trick! Beats the heck out of a rabbit in a hat. 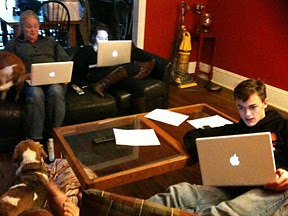 On my home shift I was helping the other boy edit a paper on Adam Smith’s Invisible hand. He did a nice job. I was particularly happy to see him using This American Life as a reference. I love that show. For those of you who would rather have your appendix pulled out of your bellybutton than try to remember what a long dead economist had to say here is a quick A. Smith refresher; individuals acting in their own self interest lead the market to outcomes that are good for everyone. OK maybe that is taking old Adam a little loose but probably not much. At the hospital it took both the Charming Mrs. YDMV and I three, maybe more, separate and fairly emphatic tries to make it clear we would manage Connor’s blood sugar with his pump and the 'log he is used to using rather than them hanging a slower insulin with their pump in his IV. In my spare time I have been reading tweets and blogs on blood glucose meter accuracy. As usual my friend Scott has a nice bit. He advocates for lower accuracy margins of error. Another other good friend of the blog (I am shamelessly steeling that good friend of bit from Colbert even at the risk of getting on his list for swiping it) Kerri also writes on the topic today as did Kelly. Careful YDMV readers will recall I wrote a bit the other day that questioned what the heck accuracy is anyway. I had a conversation on meters just hours before dragging Connor into the ER. In that chat I said I was sure there are folks, like Kerri, who work at diabetes hard enough that the meter accuracy matter in her (and the soon to be adorable BSparl’s) life makes a difference. Don’t just tell the FDA you want accuracy in your diabetes care. Tell the market. Take an invisible 2x4 in Adam Smith’s invisible hand and smack the market up side its invisible head. You want more accurate meters - buy them. Well their strips - Never buy a meter. Let them give you the meter itself. The market seems to be trying to supply cheap cr*p meters. The FDA has given the OK to boat loads of meters from firms over seas that may or may not meet our desired goals for accuracy. They probably don’t have the same level of phone support and who knows how issues with adverse actions are tracked. I don’t see these things as in myself interest and so we don’t use them. Scott point out that there is a meter on the market at +/- 10%. We happen to use it. We started for the aesthetics, they made a pink meter and that mattered to a tween girl. We stay for the low blood draw, compact meter size and easy to read screen. In short they (a word that here means WaveSense) made a better product and we for our own self interested reasons use it. If a big wave (nice pun eh?) of people did too then maybe the market would move to something like WaveSense's form factor, accuracy, usability and pinkness. By then I expect WaveSense will have moved on to even more innovative products. We didn’t let the Doc’s manage Connor’s blood sugar because we felt we could do it better. We didn’t want an insulin we didn’t have experience with in him. We didn’t know its effective time frame in him. We choose to managed his blood because doing so is in our self interest, We stayed with what we know works. Speaking of what we know, we know his pump well. If lots of parents of T1 kids also decline the hospital’s type 1 sugar management and do it well maybe the market (a.k.a. doctors there) will come to see that as a good care option and give up after the second clearly stated decline of their suggested treatment. Choose well, as we each live Our American Life we are Adam Smith’s invisible hand. PS speaking of invisible stuff. I have no relationship with WaveSense other than we use their stuff. Well OK I follow them on Twitter too if that counts as a relationship but they don’t say a lot and I am a highly incompetent twitter user. I did once look to see if they were publicly traded and was thinking about buying into their stock but they weren’t public so I was SOL. I have been to the Hospital’s community fundraisers and probably will go again. They did a very nice piece of surgery. They are right to be cautious about BG management. Side effects of reading this blog may include headache, blurred vision. Your dDiabetes May Vary. 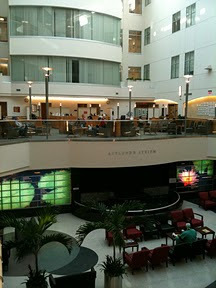 This the Asplundh Atrium at Abington Memorial Hospital. It's very nice. Not that I was planning, or even wanted, to be here. Connor is in to have his appendix out. I guess that isn't something anyone plans on. And speaking of not planning, somehow we didn't replace the backup pump set in the glove compartment. So naturally last night at half past really late his set pulled off and we needed a set. This morning looking over Connor's chart, the gas passer commented that his blood was all over the place. No kidding. He said they would watch it and if it went too high give him some insulin. Really? Mrs YMDV asked what do they think is too high? He was disconnected and without basals is gonna have rising BS. Funny they didn't ask anything that would guide them as to how much insulin to give. About that time I realized I probably didn't make sure Delaney bolused for breakfast. Oops better call the school nurse. So here we are in this really nice waiting space but my mind is still in diabetes land. Not that I was planning, or even wanted, to be here. At some point in learning to live with diabetes comes the discovery that the number on the blood glucose meter has range of plus or minus twenty percent. That tends to horrify people. The FDA is having hearings this week on meter accuracy. Good friend of the blog Ellen Ullman is testifying for patients. Yay Ellen! LY/MI! Ellen has me thinking about accuracy. My thoughts didn’t fit in a tweet. (I am a wee bit wordy - I know it is a schock) She asked at what cost more accuracy; higher co-pay, bigger meters, more blood, and slower response time, all of the above? All that begs the question that I am really trying to come to grips with: Would tighter variance standard for meters, +/- 15% or 10% result in better health outcomes? Or are there other issues in the whole of T1 care that present greater opportunities for better care? Well first off what is better care? Lower A1C? Less BG variance? I think most folks would say well it is both low A1C and less glucose variance. Will a tighter margin of error in meters achieve those results? I suspect that there are many variables in diabetes that are not with in the 20% margin of our meters. How about carb counting? Consider a bowl of spagetti. Are the sources of my information, portion control and actual consumption within 20%. Is the actual sugar content of a tomato that was used to make the pasta sauce that tight? The blend of wheat in the spaghetti? Did the manufacturer vary the high fructose corn syrup to achieve the brand’s signature taste because the tomatoes weren’t as ripe? Is that food label really that accurate? I have no idea. How about the impact of my activity? Did the effect of the gym on BG vary? Do habits about getting to the gym? Is the insulin fresh? Did it get too hot? Is the set working well? Air in the tube? How accurate is the amount of insulin drawn into a needle? How is the stress? What is the weather? How early did I pre-bolus. Assuming all of that is dead on the money, how often am I testing? Those numbers are a point in time. They have no indication of any change in the direction of BG or the rate of that change at the time. And if those numbers vary from the goal is that variation the result of a bolus issue or a basal issue? Head ready to explode yet? Is there anyone on God’s Green earth (and I will grant you there is extra green today ‘cause it is St Pat’s - I don’t thing the green die matters but the beer is another story) who has all this figured out to +/- 20%? So my two bits are this: Accuracy is promoting better outcomes. In that definition, I wish everything varied less. I think good (a word that means highly automated, very unobtrusive, dirt simple and probably working though a wireless connection between all diabetes devices) analytical tools that can incorporate the whole scope of life with type 1, including the information from meters, could have a more positive effect on outcomes in living lives’ with type 1 than accuracy range of +/- of 10% vs 20%. The real magic IHMO is in living lives’ with type 1, not dominating lives with diabetes. ... clock ahead an hour. ... battery in the smoke detector. ... and the lancet in your BG kit. The Philadelphia Inquire has an interesting front page story on a promising MS treatment. The story’s plot goes like this: researchers find a very promising treatment based on an existing generic drug. Finding the money to do the clinical trials is next to impossible. This is because there is no ability to patent the already generic drug so there is no big pay off for the treatment. To the type 1 community this is somewhere between a conspiracy theory that explains why there is no cure and eerily similar to some a certain possible type 1 treatments. I don’t much by the conspiracy theory of strip companies maliciously keeping a cure form the market. I do wonder about an industrialized health care system that has no mechanism for funding the investment in significant cost and life saving alternative. In a market driven system the cost of innovation are in theory rewarded by exclusive rights under patents. Where in that is there a process for efficiency. In classic supply and demand economic payers would demand lower cost alternative and the market would supply them. That assumes efficient markets. However the need for safety requires scientific trials. They cost huge piles of cash that are barriers to market entry. One means of reducing those barriers are the not for profit organizations dedicated to finding cures. In the Inquirer’s story it is the National MS Society that steps up to fund one step of the trials. I find it interesting to look this case to help clear my thinking about how JDRF works on type 1 diabetes. I am not as emotionally invested in MS. The detachment helps me more rationally value means of addressing the market barriers that have slowed the MS research reported in the Inquire story. That in turn makes me value the mechanism that do just similar things in the diabetes community. Specifically JDRF’s IDDP. In many cases these are funding trials with from profit companies. I have seen cries of concern over JDRF working with help for profit companies. Better that than the anguish of the trials not happening. Every month the FDA releases a list of medical devices they have cleared through the Premarket Notification process. This is also known as PMN and 510(k) but what’s in a name anyway? This often seems little more than a paper game of claiming a device is substantially equivalent to some other device so it should be allowed to be marketed. Looking over these I get the feeling sometimes the documentation may as well read, “Hey we are no worse than that thing!” That basically is the standard folks, I aint saying it any better but ita aint no worse. OK maybe I exaggerate. Or maybe not. I have no way of judging the quality of these. The market seem to be saying, "You be the judge." No pretentions of greatness at all. It is just OK. But wait while merely aspiring to be OK they do manage to hose the user with dual strips. I can just see the sales material. Our meter is ordinary, just… well… OK. But that not all with TWO strips you are twice as ordinary! Not to be confused with ezManager Max, there is the EasyMax meter. I have saved the best for last – from the Home Head Office Bureau of Backup Redundancy Department, located on Street Road, this is my favorite bit of dual double speak. They named their product to sound like someone else, claim substantial equivalence to that other product based on the “same working principle” and then point out the test principal is a difference. (k043474). Both of them have the same working principle and technologies. That all seems like silly fun and games but what if some kindly but some what befuddled by alliteration type comes along and confuses their A-Check for an Accu-Chek and puts the wrong strips in their meter? Not so much fun. Come to think of it I would be pissed if I were easily confused. Oh wait I am. Sarah is one of my good friends over at CWD. Our daughters are the same age and as a result we tend to hang out at Friends for Life. Sarah wrote on D kids eating like they would if they didn’t have type 1 and ‘just’ cover it with insulin. Sarah took this to a different level and I am so very impressed by how well she expresses a long term holistic approach that is so very hard to see in day to day variations. No where in this does Sarah suggests it is easy. It isn’t. I think that the truth about food and D is far more nuanced than most of us really like to admit. I'm a very big advocate of letting D kids be kids first and people with a chronic metabolic disease second. I have always allowed Maddie to have regular kid food. I want her to have a healthy attitude about food. I want her to able to enjoy social and communal eating. I want her to enjoy preparing good food and trying new things. I hope that through being a broad omnivore she will come to have the sort of relationship with food that should she decide as a teen or an adult to follow a less carby, less refined diet than the average person, she will be doing so from a place of knowledge rather than with a sense of deprivation. What I'm getting at, is that I believe that it would be easier to maintain minimal glycemic variability in an adult through eating a lower carb, high veg. high fiber, lean protein diet. But I believe that the path to this diet is through exposure to lots of foods and developing a smart palate, not through limiting a kid's food choices now. That certainly isn’t ‘just’ giving insulin. I find there is vast complexity to balance. Balance is beyond science. It is an art form. An art that families living with type 1 can appreciate but few others even know exists. In fact the better families are at this odd art the more invisible it becomes to others. Here Sarah eloquently points out that the art of balance goes well beyond carbs, fat, activity and insulin. She brings into focus a longer term idea of balance. Even when we get all the day to day stuff right, there are developmental, emotional and maturity complexities to consider that are difficult enough without a chronic condition. Sarah - "nuanced" is an understatement. Type 1 care is a daily juggling act with implications that touches far more than any one blood test. I salute all of you who practice the art. Its beauty is seen in the joyous lives people living with diabetes and little external sign of the effort their normal takes. Love Ya / Mean It Sarah. You're and artist. When in the Course of human events it becomes necessary for one people to dissolve the preauthorization form which have connected them with another and to assume among the powers of the earth, the separate and equal station to which the Laws of Nature and of Nature's God entitle them, a decent respect to the opinions of mankind requires that they should declare the causes which impel them to the separation. We hold these truths to be self-evident, that all people are created equal, that they are endowed by their Creator with certain unalienable Rights, that among these are Life, Liberty and the pursuit of Happiness. — That to secure these rights, Health Care Systems and Insurance are instituted among us, deriving their just powers from the consent of the insured, — That whenever any Dysfunctional System of Health Care becomes destructive of these ends, it is the Right of the People to alter or to abolish it, and to institute new Insurance, laying its foundation on such principles and organizing its powers in such form, as to them shall seem most likely to effect their Safety and Happiness. Prudence, indeed, will dictate that Insurances long established should not be changed for light and transient causes; and accordingly all experience hath shewn that mankind are more disposed to suffer, while evils are sufferable than to right themselves by abolishing the forms to which they are accustomed. But when a long train of abuses and usurpations, pursuing invariably the same Object evinces a design to reduce them under absolute Despotism, it is their right, it is their duty, to throw off such Insurance, and to provide new Guards for their future security. — Such has been the patient sufferance of these Colonies; and such is now the necessity which constrains them to alter their former Systems of Insurance. The history of the present Insurance System is a history of repeated injuries and usurpations, all having in direct object the establishment of an absolute Tyranny over these People. To prove this, let Facts be submitted to a candid world. It has refused to Assent to Laws, the most wholesome and necessary for the public good. It has forbidden It Governors to pass Laws of immediate and pressing importance, unless suspended in their operation till its Assent should be obtained; and when so suspended, It has utterly neglected to attend to them. It has refused to pass other Laws for the accommodation of large districts of people, unless those people would relinquish the right of Representation in the Legislature, a right inestimable to them and formidable to tyrants only. It has called together lobbyist to legislative bodies at places unusual, uncomfortable, and distant from the depository of their Public Records, for the sole purpose of fatiguing them into compliance with its measures. It has erected a multitude of New Offices, and sent hither swarms of Officers to harass our people and eat out their substance. It has kept among us, in times of peace, Standing Armies of Cliams Adjusters without the Consent of our legislatures. It has abdicated Government here, by declaring us out of its Protection and waging War against us. It has plundered our seas, ravaged our coasts, burnt our towns, and destroyed the lives of our people. It is at this time transporting large Armies of form Mercenaries to compleat the works of death, desolation, and tyranny, already begun with circumstances of Cruelty & Perfidy scarcely paralleled in the most barbarous ages, and totally unworthy the Head of a civilized nation. It has excited domestic insurrections amongst us, and has endeavoured to bring on the inhabitants of our frontiers, the merciless Pre-Existing Conditions whose known rule of warfare, is an undistinguished destruction of all ages, sexes and pre-existing conditions. In every stage of these Oppressions We have Petitioned for Redress in the most humble terms: Our repeated Petitions have been answered only by repeated injury. A Prince, whose character is thus marked by every act which may define a Tyrant, is unfit to be the insurer of a free people. Nor have We been wanting in attentions to our Insurance brethren. We have warned them from time to time of attempts by their legislature to extend an unwarrantable jurisdiction over us. We have reminded them of the circumstances of our emigration and settlement here. We have appealed to their native justice and magnanimity, and we have conjured them by the ties of our common kindred to disavow these usurpations, which would inevitably interrupt our connections and correspondence. They too have been deaf to the voice of justice and of consanguinity. We must, therefore, acquiesce in the necessity, which denounces our Separation, and hold them, as we hold the rest of mankind, Enemies in War, in Peace Friends. We, therefore, the Representatives of the People With Diabetes, in General Congress, Assembled, appealing to the Supreme Judge of the world for the rectitude of our intentions, do, in the Name, and by Authority of the good People of these Colonies, solemnly publish and declare, That these united Colonies are, and of Right ought to be Free and Independent States, that they are Absolved from all Allegiance to the Insurance Crown, and that all for connection between them and the State of Industry Double Talk, is and ought to be totally dissolved; and that as Free and Independent States, they have full Power to levy War, conclude Peace, contract Alliances, establish Commerce, and to do all other Acts and Things which Independent States may of right do. — And for the support of this Declaration, with a firm reliance on the protection of Divine Providence, we mutually pledge to each other our Lives, our Fortunes, and our sacred Honor. I came home to a box from the spice store. Mixing is the beginning of many things good. 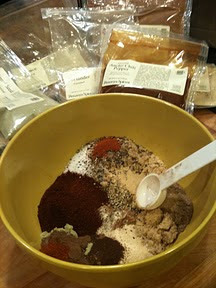 I think it is safe to say Bobby Flay's 16 spice is the cornerstone of my cooking. Great on pork. Brilliant on chicken that gets poached in orange juice. I had run out and life was getting dull. Much happieness. Mixing it up makes the house smell great. This is an interesting link. What is covered by state.